I'm a new member and new to forums. I just completed a supercharger service (using the Mod Mini video) and when I started the car initially everything seemed okay aside from some overheating from air in the coolant lines. Got that situated, but now the car is suddenly running really lean with an unsteady idle. 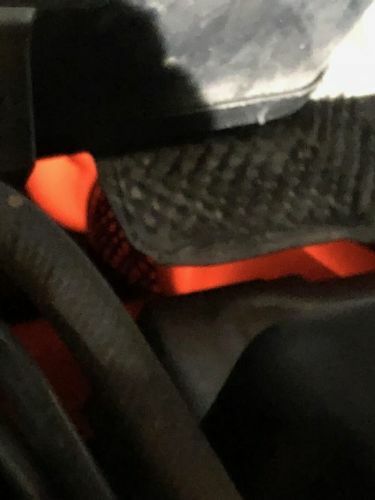 I checked under the bonnet and noticed my exhaust manifold was bright red (see attached image). I'm thinking there's a vacuum leak somewhere, but I'm not sure and I'm having trouble locating one if ther eis. Anyone have any tips on how to narrow down the culprit if it is a vacuum leak? For reference, I did not change the green gasket, but I did here the pop you're suppose to hear when it drop in place. This issue has been solved. It was an air leak due to a deformed intercooler boot. New boot and back on the road! Thanks to Kurt for the help!